Hello! I'm the Saviour of Highsec, you're you, and this is Highsec Miner Grab Bag #28! My critics say that I make a lot of enemies wherever I go, but I find that it's usually the miners themselves who tend to alienate people. 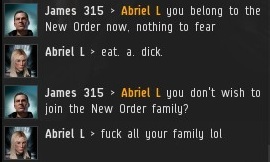 Abriel L illustrates one of my pet peeves: When miners return to their keyboards 15 minutes after being bumped out of range, and then complain that they aren't AFK. Carebear, I know you're not AFK at the time you send me the EVEmail. That does me no good. I want you to be at your keyboard when I'm speaking to you. A simple "no thanks, I don't want a permit" would suffice. You'd continue to get bumped and/or ganked for not having a permit, but still. 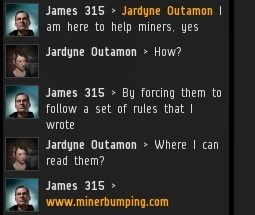 Miners act like being polite will hurt their isk/hour ratio. Maybe I would get further if I didn't stand on ceremony and rattle off my titles like that. But she did ask. The New Order has captured the imagination of the EVE community precisely because we do what seems impossible to other men. There's another reason we're so popular: If all you had ever done in EVE was putter about in highsec collecting space rocks, wouldn't the sudden appearance of the New Order excite you? Spectr StormShadow believes one man cannot make a difference. About ten months ago, most people would have agreed. Now look at where we are. That's destiny for you! It's difficult to parse his comment, but Spectr read the Code and came to the conclusion that it has something to do about 12 year-olds in their mothers' basements. I think he was trying to spit a Miner Bingo square at me and it came out wrong. 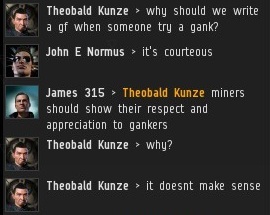 Theobald Kunze questioned one of the more controversial provisions of the Code, in which we seek to build an enduring relationship between the miner and ganker communities. The relationship is built upon a foundation of mutual respect: The miners should respect the gankers, and the gankers should respect themselves as well. There's such a stark contrast between the New Order and Adolf Hitler. The New Order and Hitler are both real, true. But Hitler is dead, and the New Order is very much alive. Yet the subtle differences between shooting Retrievers and slaughtering millions of people--these differences are often lost on the carebears. Do I detect a nod to Mintchip? Obviously, James315 is a Mintchip alt. Or maybe Mintchip is a James315 alt.
" Yet the subtle differences between shooting Retrievers and slaughtering millions of people--these differences are often lost on the carebears. " Lmao funny episode. "Because gankers are higher on the hierarchy." Bwahaha tell it like it is James! 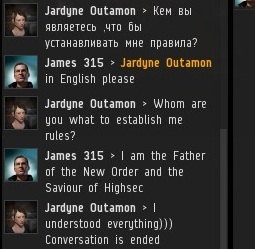 This is why you're the Savior of Highsec! I do not understand this...we meet the miners with at least the basics of respect, and what do they do? Wish death upon our familiy and children? That is insane. But you destroy their internet spaceships...didn't you know they bought them with their hard-earned space money?! The same space money they need to feed their space families. That makes you worse than Hitler! A brony is lower on the hierarchy than a highsec miner. No human will ever be lower in the hierarchy than a bot-aspirant. A Brony who does not mine is a higher life form than a miner. I've been following this blog for sometime now and I have to say that even if I don't think what there doing is good for other players it also show the aspect of eve that many other mmo fail to have people need to understand eve is a sandbox and we can do what we like with in the rule ccp handed to us. I may not follow the new order or support it officially but you are doing the right thing helping people understand that you can't afk while playing any game. More accurately, you can't expect to play AFK without risking to have your ship destroyed. They want to be perfectly safe even if they leave the PC. The ability to play AFK and occasionally is one of the things that attracts a significant proportion of players. Mining AFK in high-sec is just one part of that. Others include autopilot across high-sec, manufacturing, blueprint research, planetary interaction; all skill training which even takes place offline and trading with buy and sell offers lasting a whopping 90 days. 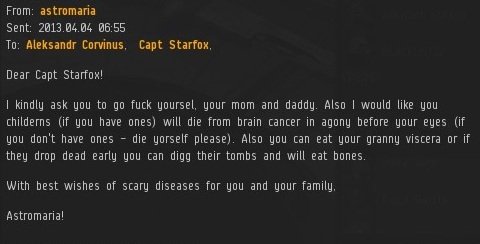 EVE can be the most intense gaming experience that is all consuming to something where the player can be part of it not even logged in. 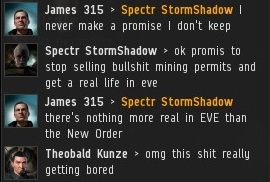 This amazing breadth of intensity makes EVE so different from most other MMO's where everything requires constant clicks. There is already an auto pilot feature and auto mine feature would be useful addition. Like auto pilot it should be less efficient than doing it manually. Fortunately for CCP, New Order are a pin prick, and it is good to see that they are fading away, and not damaging the game too much. This is so wrong that it hurts. Are you seriously suggesting that a game attracts people because they can -not- play? Playing AFK is not playing. A game attracts people because it offers FUN. AFK mining is not fun, it's accumulating space money at the expense of legit players, the ones who contribute to the sandbox. Show me in advertisements or news articles where EVE is portraited as a game that offers AFK mining as a form of "playing" and "having fun". AFK mining, like botting and cheating, it's something that bad players learn about after they join. And like botting and cheating, is something that for the good of the legit players must be purged. 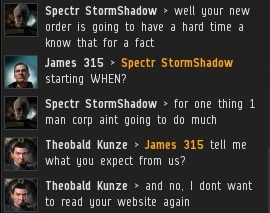 By the way, keep writing in comments that the New Order is "fading away" and/or "failing" instead of actually doing something against it in game... if you people keep writing it hard enough, maybe it will really happen! Maybe. NOTHING LIKE PUTTIN GYOUR HEAD IN THE SAND AND HOPEE IT GOSE AWAY!!!!!! "The ability to play AFK and occasionally is one of the things that attracts a significant proportion of players." 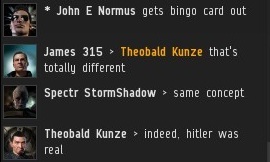 These are the very players that need to be forced to go play PvE WoW before they are allowed to destroy EvE online. Anon 1:00 PM ... unsubscribe right now. Stop playing EvE. We want yo to go away, and will keep blowing up your space pixels until you do. Oh, and your post here is proof that we scare you, and that we aren't going away. Those that complain about AFK mining should want all forms of AFK income generation and play removed e.g. training - weapons skilled based on how much weapon use. Ship manufacture should require the manufacturer to interact with the process. Maybe have to keep refueling robots, or kicking lazy workers, preventing explosions which could cause the process to fail. All manufacture should happen in POS's so is vulnerable to stronger players. Blueprint research should probably just flow from successful manufacturing. Trade orders should certainly not last longer than 24 hours. PI should be removed. Nothing should be achieved AFK. I personally think that would be bad. But it would force more interaction and would be a consistent viewpoint. Why single out mining? The real reason is just that those who want easy kill-board kills and to grief others also want to self-justify. No one singled out mining. The distinction is quite simple: things that your ship does while you are in space should be done ATK: missioning, mining, hauling. Things that happen not in space, and are thus designed to be done by minions, such as PI and research, are done AFK. Nothing is singled out. Agreed with Anon 3:44 PM. Trust me, the New Order will focus on all of the above after we're done saving the EVE Universe from AFK Mining.